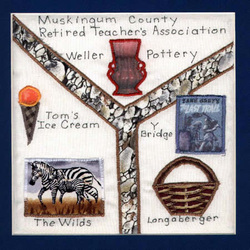 The Muskingum County Retired Teachers Association has been an active organization for forty-one years. The organizational meeting was held on July 1, 1965 with thirty-seven retired teachers present. MCRTA currently has 225 members. Zanesville City, East Muskingum, Franklin, Maysville, Tri-Valley and West Muskingum Local Schoo lDistricts, Mid-East Career and Technology Center, Zane State College and Ohio University-Zanesville are represented by the group. MCRTA is located in southeastern Ohio and is home to author/sportsman Zane Grey, the famous Y-Bridge, The Wilds, The Longaberger Company, nationally acclaimed Tom's Ice Cream Bowl and has a rich history of ceramic production - Weller, Roseville, Ransbottom, McCory, Hartstone and numerous other potteries. The bi-monthly luncheon meetings are attended by over 100 retired teachers. Our mission is to support the educational community, affect political changes for education, provide social opportunities for retirees as well as inform members of ORTA and NRTA activities.